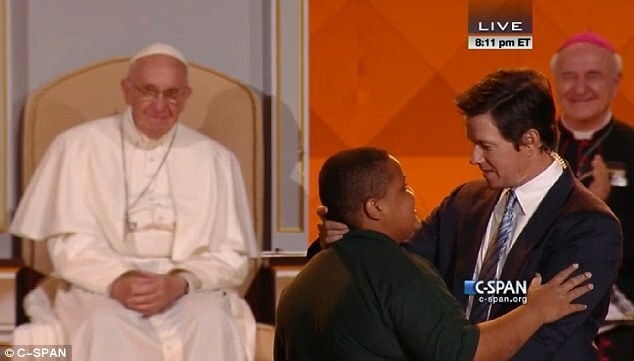 Mark Wahlberg’s best moment emceeing the Festival of Families in Philadelphia came right after Bobby Hill sang a pure and piercing Pie Jesu before Pope Francis and the world. The boy got to meet the Holy Father, a thrilling moment for him. Then Wahlberg beckoned him over. Is it me or did the kid look even more happy to meet movie star Wahlberg? Anyway, Wahlberg’s praise was unscripted and sincere. The kid beamed. “I love you,” he seemed to say. “I love you too man,” Wahlberg said, with his hand affectionately behind the kid’s head. When he got back to the podium, a beat later, Wahlberg realized what the kid had really said, and he shared it with the world. You had to be there or at least to be watching to get the sense of humorous chagrin. The live audience got it and even the uber-Catholic Jim Caviezel was howling with laughter. Why? Because we’ve all been there: caught doing something we know we shouldn’t be doing. And we’ve all hoped that somehow God will let us off the hook, because look, we really do love You! We’re like wayward children who, if we can’t get permission, figure we can at least charm Daddy into forgiveness. People have suggested that Caviezel would have been a better emcee — more dignity, more along the lines of what a Catholic should look like. But, while I love Caviezel, I am grateful for the witness that Wahlberg gave that night. It wouldn’t have been possible without his unstudied frankness. He gave the world a momentary glimpse into his conscience, a Catholic conscience. Wahlberg showed that even when sin is paying off, even in the midst of it, we’re not entirely fooled. All of us have our attachments to wrong things that we justify to ourselves, but we know that these things don’t stand up in the light of our faith. And it matters. Catholicism is not the sin-boldly brand. We don’t for a minute believe that we are really going to get away with the wrong stuff we pull. This is especially clear if we are praying; and Mark Wahlberg does pray, daily, before the Blessed Sacrament. I know it because that’s what I’d do, too. And that is why every Catholic on the Ben Franklin Parkway was laughing. We’re sprinkled with the same water. The Catechism calls it the baptismal character. It’s like a watermark on your soul that can never be duplicated and never rubbed out. It changes you. It elevates your status, and it never lets you forget it. It’s hard to explain to someone who doesn’t have it. In Brideshead Revisited, convert Evelyn Waugh gave it a shot by having Julia Mottram try to explain it to her lover, Charles Ryder. She wants it for her child even though she’s lost it herself, not for nostalgia’s sake, but because it’s real. It tells the truth. The truth is: We are made for better things than our sins. No matter what we do, no matter how attached to our sins we may become, we can’t completely deceive ourselves about their real nature. Sin and salvation cannot ever co-exist peacefully. In a moment of humorous chagrin, Mark Wahlberg explained that to the world. This appeared on the National Catholic Register blog.